How to Make Tasty Snacks Soft Kue Putu Ayu .Putu Ayu is the name of one type of wet cake making use of the composition of ingredients such as flour, pasta pandan, eggs, milk and grated coconut. Because it uses a mixture of pandan paste, wet cake consequently passing through this steaming process comes with a dominant green color. 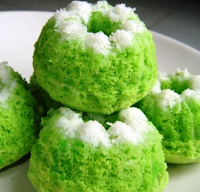 In addition, cakes Putu Ayu also has a distinctive look that is contained grated coconut on top of it like a cake topping. Soft texture and sweet taste savory, served as a treat fit for various riungan event. The composition is easily obtained and the manufacturing process is simple enough to be possible for anyone to mengkreasikannya through the kitchen of the house. For those of you who want to try to make it able to retrace the steps Ayu Putu cake presentation as in the following recipe. Break the eggs and pour the batter into a container and add the sugar, beating until evenly and inflate using a mixer. Add beaten eggs in a container of dough with the flour gradually and stir again until evenly distributed. Pour pasta pandan and coconut milk mixture into the batter container and stir again until evenly distributed. Grated coconut and mix with salt and steamed until cooked. Remove and set aside. Take the cake mold and let Putu Ayu spreadable oil to taste. Take grated coconut steamed cooked and pour into molds putu ayu. Tap-tap so solid then add to the dough that have been made earlier. Steamed mold that already contains grated coconut and Putu cake batter until cooked. This steaming lasts ± 15 minutes in length. Lift the pastry putu steamed cooked and remove from the mold. Kue Putu Ayu ready to be presented. That he steps manufacture of wet cake tasty snacks from putu ayu. This cake can be present as a treat snack on the coffee table, a variant of snacks in the snack box or cake treats as well as various events such as social gathering or celebration. Good luck and good luck recipe. 0 Komentar Untuk "How to Make Tasty Snacks Soft Kue Putu Ayu"